Scott McCloud’s new graphic novel door-stopper has a little bit of something for everyone, especially if you’re the creative type. It’s about a relationship . . . and about art and creating . . . and what it means to be successful and remembered . . . and what it means when you die and are forgotten . . . and why we all exist on this little planet in a giant universe and what’s the point of it all. The story is real and emotional and moving; you simply won’t be able to put it down. David Smith is an artist, a sculptor, who loses himself in his work and really feels he’s going to make it one of these days, but he’s out of money and losing hope pretty fast. After having a conversation with a deceased family member he strikes up a deal with death and is able to create art with his bare hands. Now he feels he can create the art he has wanted to for so long, with no inhibitions, and will finally become the renowned artist he has always wanted to be. But because this is real life, even with a supernatural slant, things still don’t always go his way. Then there is Meg, a pretty girl who has helped David along when he was destitute and who he is quickly falling in love with, but isn’t sure if she is interested in him. He has also made a promise not to tell her he loves her until she can do the same to him. McCloud is clearly pulling a lot from past real-life experiences with The Sculptor to create a story that any reader and follow and related to and be moved by. It is art in many forms that whisks you away and never lets you go. Originally written on January 10, 2015 ©Alex C. Telander. 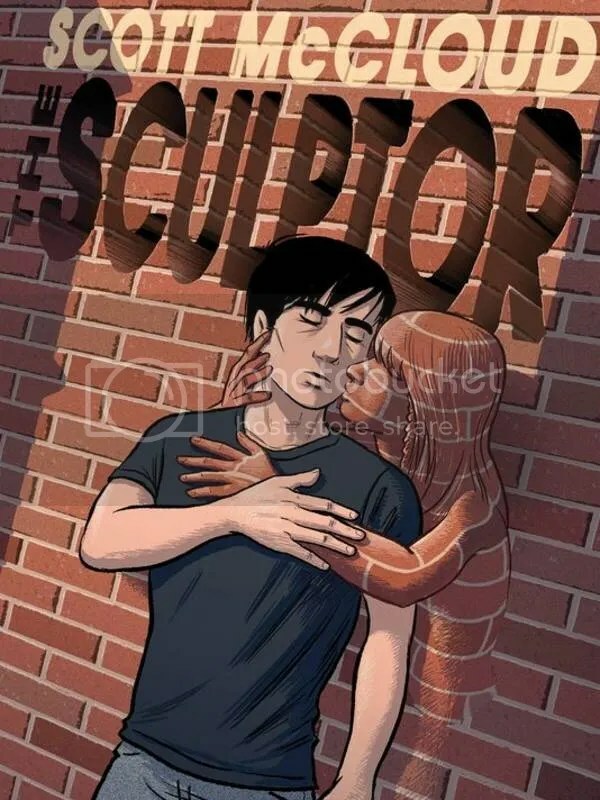 To purchase a copy of The Sculptor from Bookshop Santa Cruz, and help support BookBanter, click HERE. Bestselling author Cory Doctorow, of Little Brother and For the Win, and Jen Wang, known for her work with the Adventure Time comics and her graphic novel Koko Be Good, join forces to create a graphic novel about teenage girls, massive multiplayer online games and what gold farming really means. It’s a funny, addictive, entertaining but also sobering story that any gamer will soon become a big fan of. Anda, a chubby teenager, gets introduced to a massive online game (MMO) called Coarsegold Online where she joins a female-only guild and has lots of fun leveling and gaining loot. She soon learns about gold farming from a friend in game, which consists of players from developing countries illegally collecting valuable objects and selling them to players from developed countries. But she soon befriends one and discovers while it may be illegal in game, it’s this boy’s life and how he makes money and supports himself and his family. Anda changes her stance about gold farmers and wants to see if she can help her new friend in some way and help him improve his way of life. 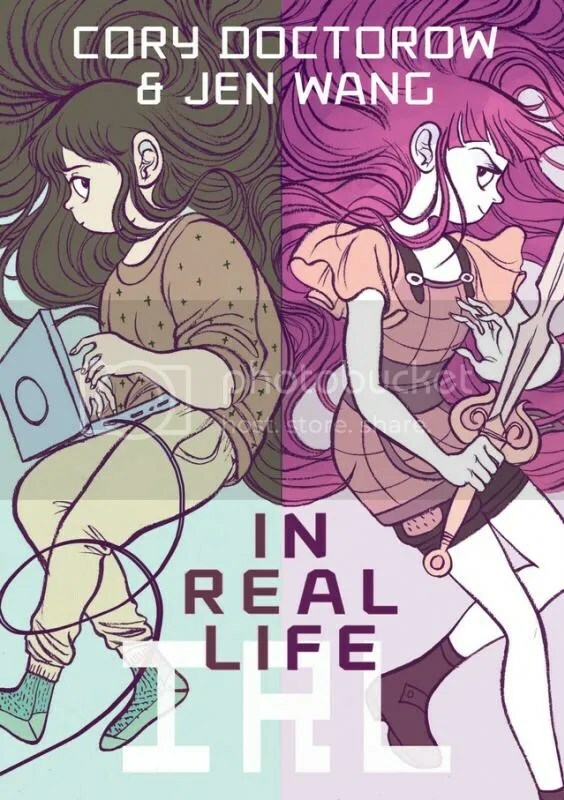 To purchase a copy of In Real Life from Bookshop Santa Cruz, and help support BookBanter, click HERE. From the author and artist of the popular Lewis & Clark graphic novel comes his next bold adventure, taking on the life and legacy of Ernest Shackleton. 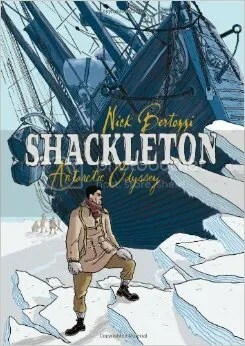 In this short but poignant graphic novel, Bertozzi covers a lot of ground historically with regards to Shackleton. Told with short scenes where the adage a picture speaks a thousand words is put to full use, Bertozzi covers Shackleton’s failures in trying to reach the south pole in the heart of Antarctica, and his next bold mission to cross the great Antarctic land mass. Readers get scenes of Shackleton putting the team together, a hodge-podge of men who will soon become very close starving on the ice; crossing the ocean and reaching the frozen wasteland; and then their journey upon the Endurance through the ice until they become stalled and must make some monumental decisions. Bertozzi uses his skill as a storyteller and artist, bringing humor to a seemingly dry historical subject, but also color and life to the various characters, making them real people suffering in these harsh conditions. Shackleton does a great job of telling a complete, emotional story in a short book that will provide useful quick reading for anyone wanting to know more about Sir Ernest Shackleton. To purchase a copy of Shackleton: An Antarctic Odyssey from Bookshop Santa Cruz, and help support BookBanter, click HERE. 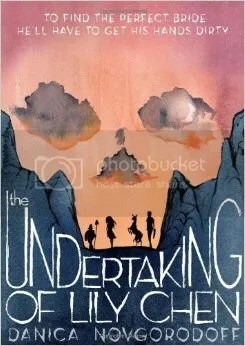 The Undertaking of Lily Chen plays on an old Chinese tradition that upon the loss of life in an important man, he must have a corpse bride to accompany him into the afterlife. What seems a pretty dark and grim storyline is made humorous and entertaining under the hands of Danica Novgorodoff, with some important lessons to be learned about the meaning of family and honor. Deshi is a hapless man who has tried his best to do well in life, living under the resplendent shadow of his brother who is the light in his parents’ eyes, until he is accidentally killed in a foolish accident. Deshi holds himself to blame and quickly earns the ire of his parents, so he plans to find his brother the perfect corpse bride for his journey into the afterlife, which will finally make his parents happy with him, he hopes. Hilarities ensue with him searching for all forms of buried women that are in various states of decay and simply not suitable for his brother; he even goes so far as to hire a professional to acquire the right cadaver for his brother. Eventually he realizes he must simply kill a live woman, as that is what it will take. Enter Lily Chen. But as the two get to know each other Deshi soon knows he cannot commit this act as he is falling for this strange but wonderful woman, but at the same time he does not wish to disrespect his parents or the memory of his brother, and a scheme must be hatched between the two. 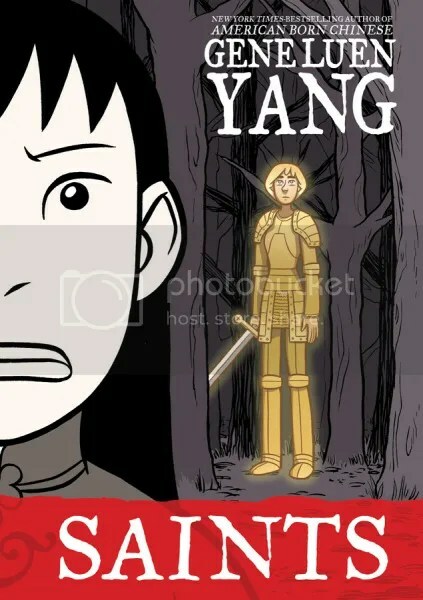 A story that is unusual, entertaining, surprising and moving, The Undertaking of Lily Chen is a like no other graphic novel for its plot, while its art employs great use of black lines and occasional hints of color that lend meaning to the story. If you’re looking for something different but also great, look no further. Originally written on April 18, 2014 ©Alex C. Telander. To purchase a copy of The Undertaking of Lily Chen from Amazon, and help support BookBanter, click HERE. 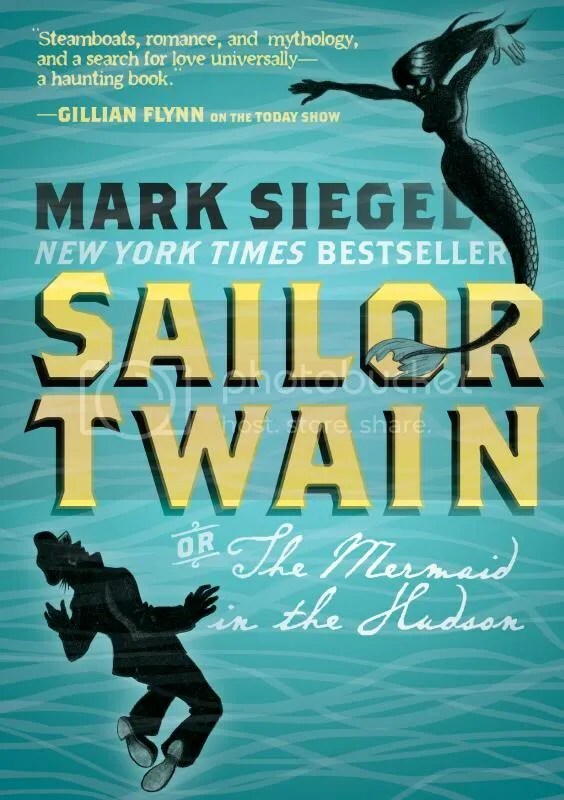 With the catchy title and the entrancing book cover (be it the hardcover or recently released paperback), one might think this an interesting graphic novel involving one Mark Twain, but in fact it is about a relative of the author who is a captain on a riverboat on the Hudson River. Captain Twain is recounting his story aboard his ship the Lorelei involving a mythological tale of a mermaid that he ends up meeting and secreting away in his cabin for some time – even though he is a married man. At the same time a reclusive author who has something to say about these mythological creatures reveals herself to the world in a shocking fashion. And a French nobleman is seeking a way to turn around a curse he believes is befalling him. An interesting tale that at times becomes a little too convoluted and perhaps loses the reader, the artwork is nevertheless impressive, and the story has elements of both Twain and Poe, enshrouding it in an interesting mythology during a time over a hundred years ago. To purchase a copy of Sailor Twain from Amazon, and help support BookBanter, click HERE. 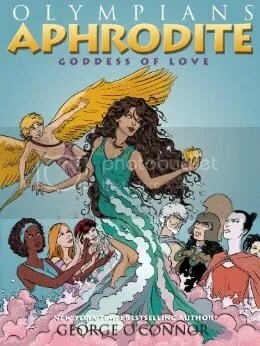 In the sixth volume of the Olympians series – proceeding Zeus, Hades, Poseidon, Athena and Hera – graphic novel writer and artist George O’Connor takes on the goddess Aphrodite, the goddess of love. One might expect a lovey dovey story, but O’Connor instead presents one of how a new goddess can upset the whole Greek pantheon. Aphrodite is born of love and is beautiful to behold, but her intention is for everyone to be truthful and honest about their feelings, even to their own detriment. Zeus soon puts a stop to this, marrying her to the ugly, burly Hephaistos, the god of fire and smithing. Aphrodite is bored with her married life and gives birth to Eros (better known as Cupid), who immediately starts sowing mischief. It is an interesting story of love and jealousy, where everyone wishes to come after Aphrodite and Eros for what happens, when they only have themselves to blame. With a vibrant, colorful art style, readers of any age will enjoy this graphic novel for its storytelling and its artwork, and it represents a welcome addition to the growing Olympian collection. Originally written on January 25, 2014 ©Alex C. Telander. To purchase a copy of Aphrodite from Amazon, and help support BookBanter, click HERE. The companion volume to Boxers, the duology is the first graphic novel to make an appearance on the National Book award Longlist. Saints is the other side of the tale, focusing on a young girl and her journey across China after meeting briefly with Bao, and presents a completely different side to the Boxer Rebellion. Four-Girl has had a tough life so far. She is the unwanted fourth daughter of the family who is expected to do her chores, work herself to exhaustion, and act like the dutiful child she is. But she knows she is hated by everyone, with her ugly features, and wants to just be the evil little devil everyone thinks she is. So she does the worst thing she can think: she converts to Christianity and begins to learn about the faith from one of the foreign devil priests. She takes a new, Christian, name, Vibiana. But the Boxer Rebellion is ramping up, going against and slaughtering her new Christian people, to defend the Chinese of her family and heritage. Four-Girl will have to choose where her allegiances lie. Saints is a wonderful tale of the other side of this tumultuous time, exploring the Christian side of events and creates a delightful quest in Vibiana going on her own journey, sometimes with the likes of Joan of Arc as a companion. The art and sparing use of color lend credence to the story, making it a memorable one. To purchase a copy of Saints from Amazon, and help support BookBanter, click HERE.